The Plaza Mayor was built during Philip III's reign (1598-1621) and is a central plaza in the city of Madrid, Spain. 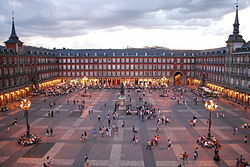 The Plaza Mayor is rectangular in shape, measuring 129 m × 94 m (423 ft × 308 ft), and is surrounded by three-story residential buildings having 237 balconies facing the Plaza. It has a total of nine entrance ways. The Casa de la Panadería (Bakery House), serving municipal and cultural functions, dominates the Plaza Mayor. This article uses material from the Wikipedia article "Plaza Mayor of Madrid", which is released under the Creative Commons Attribution-Share-Alike 3.0 License.